Anytime you are using a computer or other device that is “unfamiliar” to the online banking system, you will be prompted to receive a Secure Access Code, a one-time PIN used to verify your identity. The Secure Access Code is part of the government mandated Multi-Factor Authentication (MFA) process that requires a user to provide two or more of three possible authentication methods. In the prior system, you were presented with a Challenge/Response question each time you logged in from a new device. The Secure Access Code is considered to be a more secure feature as many of us tend to choose Challenge/Response questions that could be answered through publicly available information. How do I get a Secure Access Code and what do I do with it? Enter the Secure Access Code into the Secure Access Code input screen and press "Submit"
Why is the system asking me for the Secure Access Code every time I login? When you enter your SAC, your web browser stores a cookie telling the system that you have already logged in before. If you are using a different browser, a different computer, or have deleted your browser's cookies, you will be prompted to enter a SAC again. 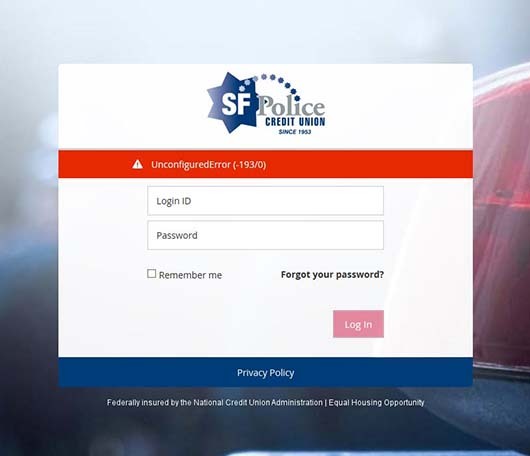 If you have received an "Unconfigured Error" message while attempting to login, you may need to try logging in with your username instead of your member number. Q: The login box says “Member Number/Login ID.” Can I login with my member number? A: In our previous system, you could login with either your member number or self-created username (Login ID). The new system is different and you are required to login with your username. If you can’t remember your username, contact us at 800.222.1391 and we will retrieve it for you. Q: What if I never created a username? A: In that case, you can continue logging in with your member number. You will be prompted to create a username (Login ID) in the future. If you have forgotten your Login ID, you can retrieve it via email by clicking the "Forgot Login ID" link underneath the Online Banking login box on our homepage. For your security, you will be prompted to enter your member number, Social Security number, zip code, and email address. If you have forgotten your password, you can reset it by clicking "Forgot Password" in the lower left corner of the Online Banking login box. For your security, you will be prompted to enter your Login ID and a Secure Access Code before setting your new password. To check which browser version you are using, click here to use our Browser Compatibility Tool. Q: What is a Login ID? A: Your Login ID is the username you create to login to Online Banking. ​Q: What do I do if I am locked out? A: You are allowed three (3) incorrect password attempts before your account is locked and access is denied. When this happens, you will have to wait 1 hour or contact us at 800.222.1391. A: If you have forgotten your password, you can call us at 800.222.1391 to reset it. If you're already logged in, you can reset your password by navigating to Settings > Security Preferences > Change Password. Q: Why is the system asking me for the Secure Access Code every time I login? I have already logged in for the first time. A: When you enter your Secure Access Code, your web browser stores a cookie telling the system that you have already logged in before. If you are using a different browser, a different computer, or have deleted your browser's cookies, you will be prompted to enter a Secure Access code again. Q: When I try to login, I get a message telling me that I need to upgrade my browser, even though your Browser Compatibility Tool tells me I am using a supported browser. A: If you're using a supported version if Internet Explorer (9.0 and above), you might have to edit your browser settings if you are seeing a browser upgrade message. Under Tools > Compatibility View Settings, make sure the two checkboxes below are unchecked. Additionally, you will need to make sure that sfpcu.org is not listed under "Websites you've added to Compatibility View."